The payoffs from regular exercise and a healthy diet don’t really need to be talked up — you’ll look better, feel better, and live longer, which is cool. But there’s yet another reason why you should be working out and eating right – it makes you smarter. 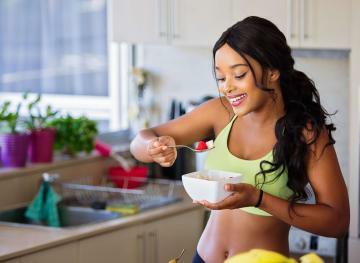 In a study from Penn State and the University of Nebraska, researchers found that, amongst 105 female college students, those with the highest fitness levels and adequate levels of ferritin (a blood cell protein that stores iron) had greater cognitive functioning than their peers. Although the sample size in this study is relatively small, this study is important because iron deficiency is the most common nutritional deficiency in the United States, and women are particularly at risk. Iron is needed to produce hemoglobin, a protein that carries oxygen from the lungs to the rest of the body. Also known as iron-deficiency anemia, this condition inhibits the rest of your organs from doing their job — though this form of anemia is very treatable. Subjects were divided into three groups: high fitness and normal iron, high fitness and low iron, and low fitness and low iron. Not surprisingly, women in the first group — high fitness and normal iron — had the highest GPAs as well as the best scores on computerized attention and memory tasks. Students with high fitness and low iron had the next best set of scores, while the last group had the lowest scores. “We conclude that combined iron deficiency and low aerobic fitness — importantly, both modifiable factors—may doubly burden academic success in young-adult women,” the researchers wrote. Of course, though this study used academic success as a measure of cognitive ability, it’s not just college students who benefit from making the most of their brains. With that in mind, get your money’s worth out of your gym membership and get familiar with iron-rich foods like meat, fish, poultry, and leafy greens.